Poorly designed SharePoint and Office 365 applications result in non-compliance and thus not meeting your organization’s governance plan. 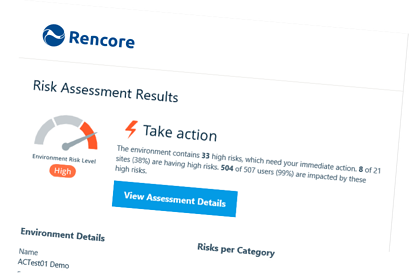 Take our Free Risk Assessment to understand how your SharePoint applications are built and which ones are not compliant. Applications that are not compliant can have a range of detrimental effects for your business such as loss of intellectual property, legal fines, competitive disadvantage, noncompliance with standards, and image loss. Make an action plan today to govern your applications and stay compliant.